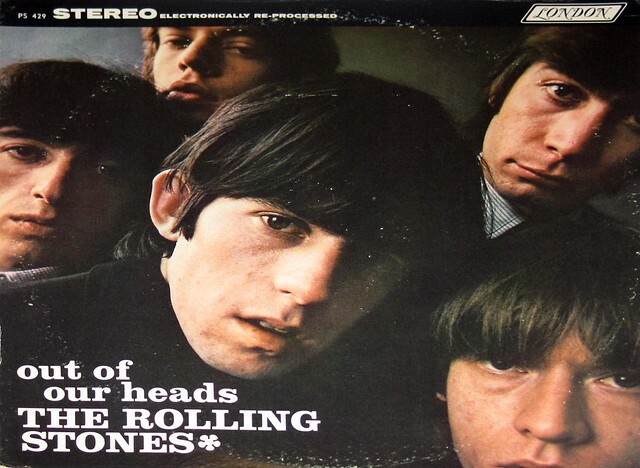 "Out of Our Heads" is The Rolling Stones' third British album and their fourth in the United States. It was released in 1965 through London Records in the US on 30 July 1965, and Decca Records in the UK on 24 September 1965 (in both mono—catalogue number LL3429; and in stereo—PS429), with significant track listing differences between territories. 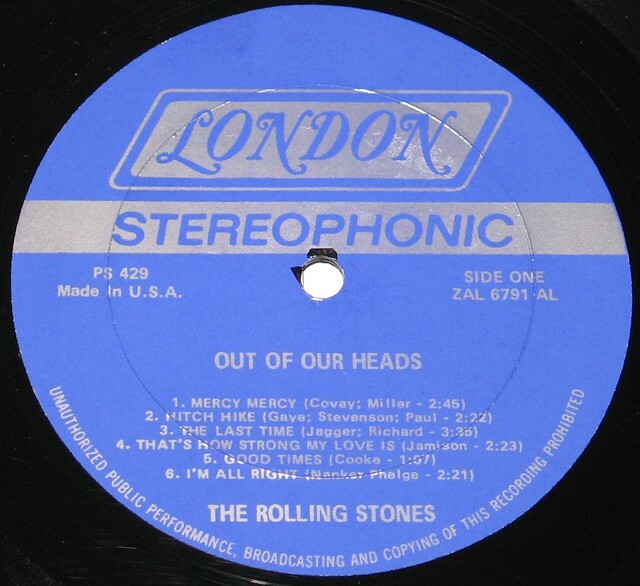 Initially issued in July 1965 in America , "Out of Our Heads" was a mixture of recordings made over a six month period, including the Top 10 hit "The Last Time", the worldwide number 1 "(I Can't Get No) Satisfaction" as well as a track from the UK-only live EP Got LIVE if you want it!. Riding the wave of "Satisfaction"'s success, Out of Our Heads became The Rolling Stones' first US #1 album, eventually going platinum. In 2003 the US edition was listed as number 114 on the List of Rolling Stone's 500 Greatest Albums of All Time. 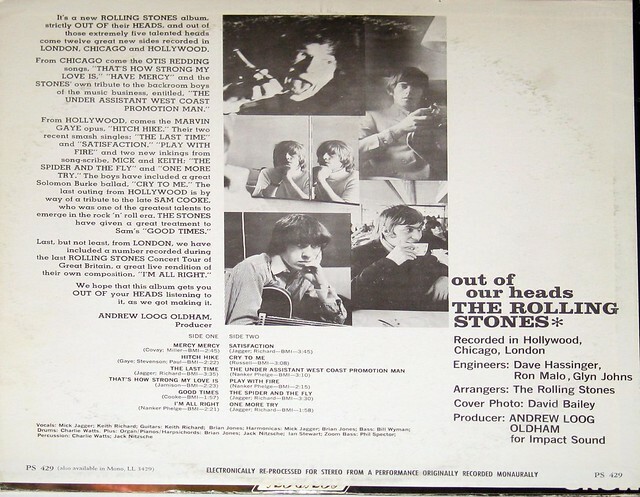 The British "Out of Our Heads" — with a different cover — added songs that would surface later in the US on December's Children (And Everybody's) and others that had not been released in the UK thus far (such as Heart Of Stone) instead of the already-released live track and recent hit singles (as singles rarely featured on albums in the UK in those times). Issued later that September, Out of Our Heads reached #2 in the UK charts behind The Beatles' Help!. It was The Rolling Stones' last UK album to rely upon R&B covers; the forthcoming Aftermath was entirely composed by Mick Jagger and Keith Richards. Producer: Andrew Loog Oldham for Impact Sound. Recorded in Hollywood, Chicago, London. Engineers: Dave Hassinger, Ron Malo, Glyn Jones.